Joe Farren, British Wool CEO provides an overview of business strategy with one key deliverable in mind - ensuring our producers get the best possible price for their wool. What is British Wool focusing on? I describe our strategy as a virtuous circle – the result of each activity reinforces and often increases the beneficial effect of the next. Our marketing is designed to drive consumer interest to partner retailers who feedback to partner manufacturers, ultimately resulting in greater consumer demand for a greater number of British Wool product lines. In this way, we’ll increase the price paid for British wool at auction. There are two key areas we’re working on to achieve this – increasing value per kilo and improving operational efficiency and effectiveness. A new tactical approach to structuring our auctions allows us to analyse any trends and anticipate buying patterns ahead of each sale. This has helped to support prices through the 2017 season. At the start of the 2018 auction season we introduced an agency buyer into the auction room, aiming to increase competitive tension. Bidders don’t need to be present in the room, and instead pass orders with price limits to the agency buyer ahead of the auction who will then bid against these orders at the auction. Early signs indicate that this approach will be successful. China presents a large and attractive market for British wool rich products. At the start of October we opened a new office in Shanghai which will support our efforts to target a new market, and take advantage of a very exciting opportunity for British Wool. Our new licensee scheme will add real value to British wool. It’s supported by an internet hosted audit trail of British wool content right back to the wool merchant, validated by selective spot testing. This means consumers can have complete confidence in products bearing our licensee mark, adding value to British wool as a fibre and assuring quality for consumers. 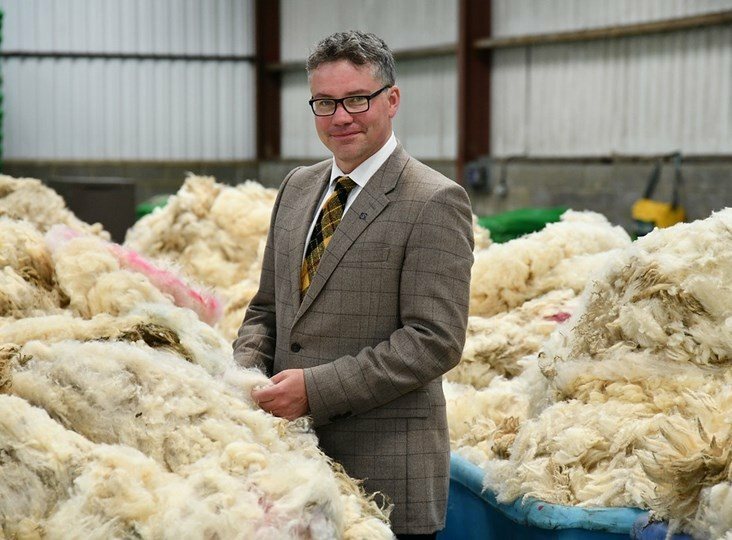 We will continue to market British wool as a distinct quality fibre, explaining its unique features and benefits in a way that is relevant to each product range. This activity will be delivered through retailers, consumer facing digital advertising channels, and at carefully selected consumer focused shows such as Grand Designs. A number of carpet retailers are trialling our new point of sale materials, which are designed to grab the attention of consumers at the point of purchase, effectively supporting carpet sales in retail premises. 55% of our wool goes into carpets, so this is a logical place to trial any new materials. Our depots delivered a c£600,000 labour cost saving in the 2017 season. We will focus on maintaining and improving this year-on-year. We are committed to improving our service to producers, maximising cost effective opportunities for producers to deliver their wool to us. This year we opened new trial intermediate depots in County Tyrone, Northern Ireland and Penrith, Cumbria. We also re-located our Ashford depot to a more convenient location, and provided further storage space at Liskeard, offering local producers greater delivery flexibility. We have recently completed a business process audit to identify ways we can improve our internal processes and deliver better service to producers. A number of these changes have been implemented immediately, aiming to improve communication and simplify procedures. Why is working together important? ‘Stronger together’ is all about teamwork – with our producers, within the industry and also internally. The more producers who sign up to British Wool, the more efficient we can be, and the better returns we can deliver to everyone. The more effectively we work together internally, the quicker we’ll progress with delivering our strategy. We have all the building blocks for success in place - positive leadership, strong and effective relationships within the industry, and a highly skilled, expert management team. Implementing a new strategy is always a long term plan, but we’ve gained some real traction this year, and we’re looking forward to driving value for producers.